What a lovely day it has been today. Sunny until this afternoon when it started to get cloudy but the clouds were a relief because it got hot! It is currently 80F (26.7C) outside with the clouds. Some of you might think that is a perfect temperature and it would be pleasant if I were sitting in the shade with a cold drink in my hand but out in the sun working, I probably sweated off five pounds today. But Bookman and I have been having lots of fun and drinking lots of water. birds and bees. But it was no pond. I would like to try and attract a toad to the garden and a bird bath fountain is not going to do that, we needed a pond. 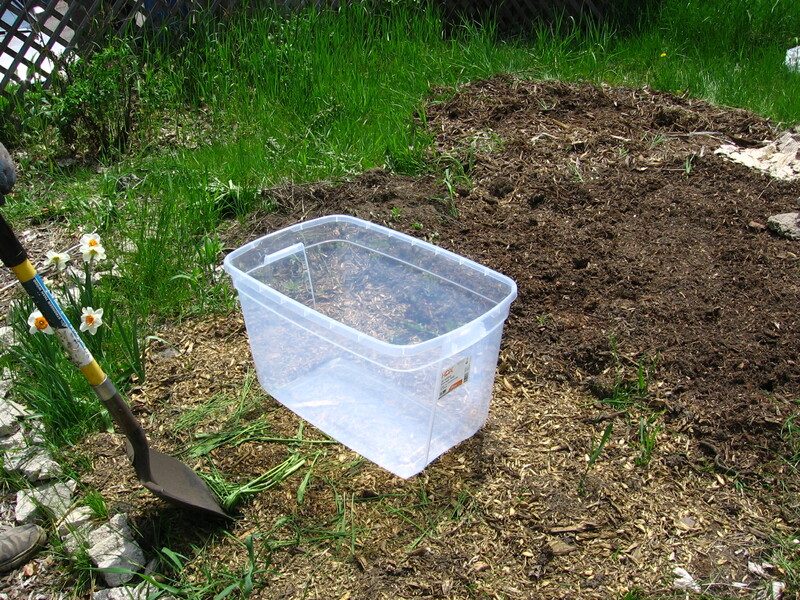 And when I found a great video on YouTube that showed how to make a small pond from a storage bin, so easy I could do it myself without Bookman’s help, I told Bookman he had been overruled on not having a pond. He grumbled a bit and I think he thought I’d just give up on it but I’d mention it now and to let him know I wasn’t going to forget. When I reminded Bookman a few weeks ago that I was going to put in a pond and would be soon going to in search of a bin to make it out of, he asked to see the video so I showed it to him. He was surprised at how easy it was but was still skeptical, worried about mosquitoes. I can’t say I blame him, he is very allergic to mosquito bites, each one becoming a walnut-sized itching welt. I did research on how to make sure the pond does not become a mosquito breeding ground and Bookman was satisfied enough that he decided that it was worth giving it a try. Off we went this morning to the home improvement store. 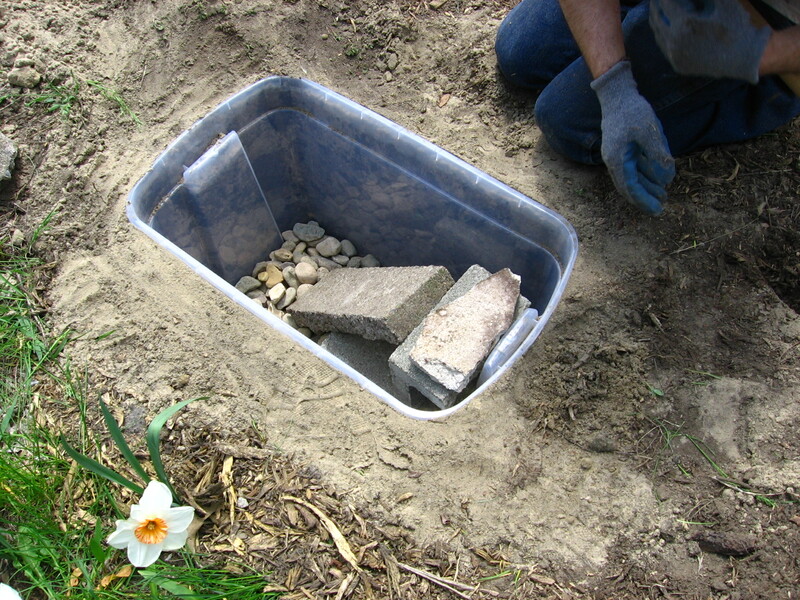 We debated over storage containers – how big, deep and short or shallow and long — disagreed over gravel and rocks — pea gravel like in an aquarium or bigger river rocks. We also bought some sand for the bottom of the pond hole and some silicone and while we were at it several solar path lights. The container we got is clear 20 gallons (75.7 liters). We had to get the clear silicone to fill two small holes at the top of the bin where a lid would lock. Holes filled and silicone drying, we walked around the garden debating where to put the pond. Once we chose the area we then quibbled over how to position it. That was the hardest part! We had a blank canvas and had to imagine ourselves into the future, plants growing nearby and Bea the honeycrisp grown up bigger. Next it was time to get down to business. Bookman raked away wood chips, marked where the pond edges were going to be and started digging. 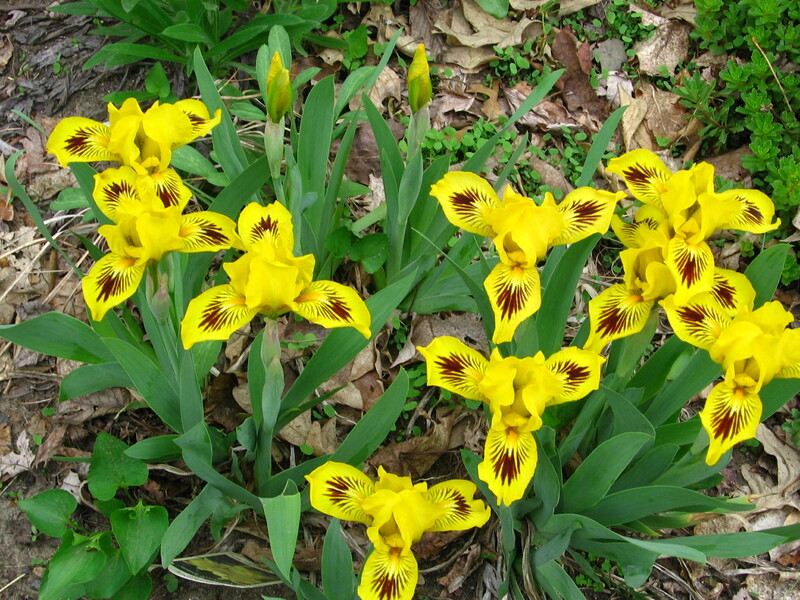 We’ve known for years and years we have sandy soil but when we don’t dig down more than a few inches to plant something we don’t really think too much about it. 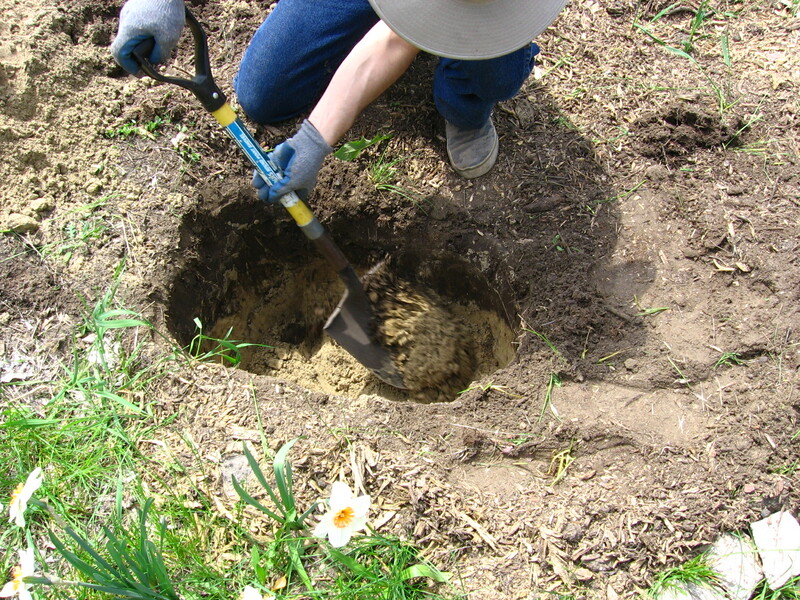 Digging for the pond, after the first 8 or 9 inches (20 – 23 cm) of topsoil, it was all sand. The sand is so very fine that we didn’t even need to open the bag of sand we had bought. And now we have a full bag of sand and a small pile of sand from the pond hole and no place to put it. We’ll figure something out eventually. 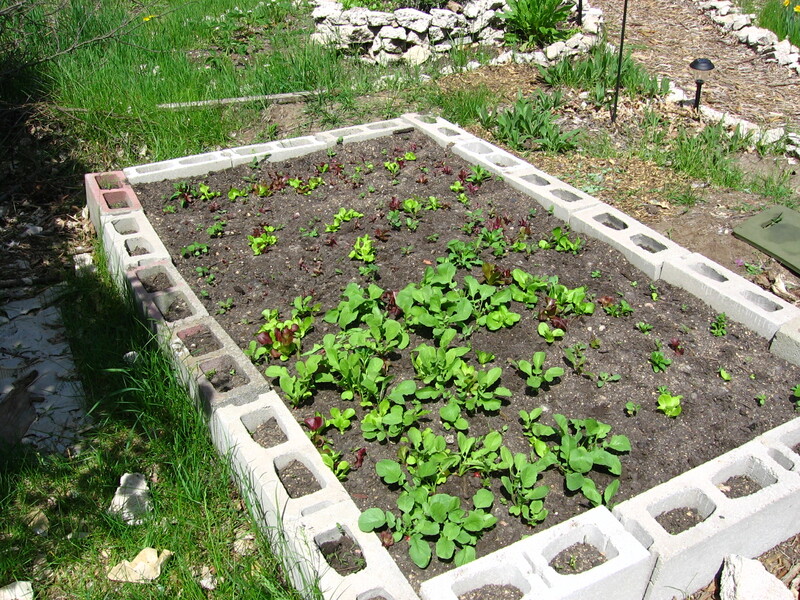 an old broken cinder block to create a ledge, placed a long flat rock as a sort of ramp, added a few more river rocks on the ledge, edged the pond with broken pieces of concrete and put a pot with watercress seeds in it on the ledge. We filled the pond with water from our rain barrel. The pond turned out to be not quite level, but you can’t tell unless you really look. During the pond building process Bookman actually said he was having fun. I didn’t believe him at first and asked if he was being sarcastic. No, he said, he really was having fun. And later he even said he was happy we have a pond and joked that he was glad he had thought of it! Nonetheless, I am the one who will be cleaning it and taking care of it. I said I needed to get a net and he said no, he thought I’d get a wetsuit and dive in. I suspect he’d prefer a bikini and a snorkel though if I gave him the option. Thankfully, neither wetsuit nor bikini will be needed to take care of the pond. Bookman decided the pond needed a name, looked at me and said, you know what it is don’t you? Um, Walden Pond? I asked. Nope. Um, Golden Pond? Nope. He starts grinning and says, the Doctor knows. Amy Pond! I said and we both laughed, so very pleased with ourselves. button seeds in an area around Amy Pond. Next year at the plant sale we’ll get some perennial plants to fill in the area. We are pleased with Amy Pond. It really was easy to do. Now we’ll see if a toad decides to take up residence and if we’ve managed to create a place for the fish to hide should a raccoon decide to try and have a snack. In other garden doings, I found the zucchini seeds! They had gotten shoved to the back of a drawer along with the missing purple cabbage seeds. I planted a few zucchini seeds in the spot we left for them in the veggie bed. 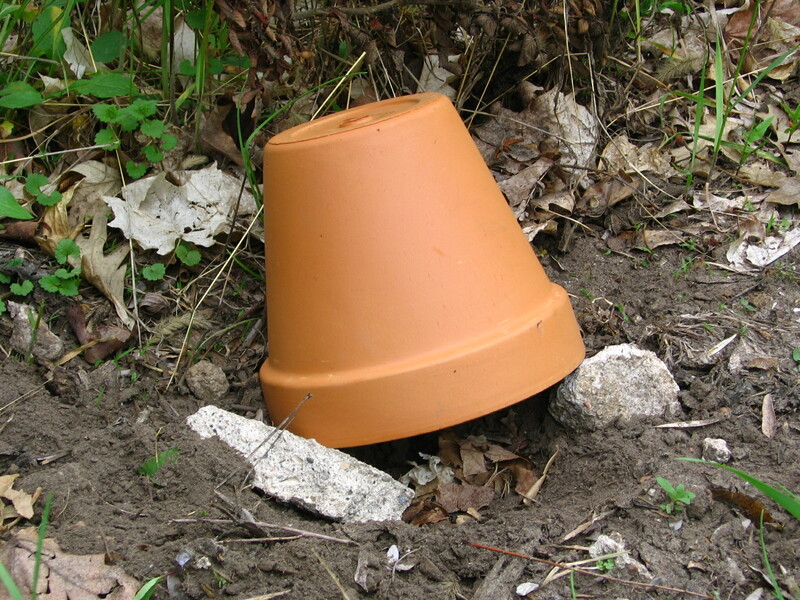 I filled a couple of pots with seed starter soil for the cabbage and planted those in the pots. They will eventually be transplanted to the polyculture bed. Speaking of the polyculture bed, I took the row cover fabric off of it. I am equal parts pleased and disappointed. The plants were supposed to be more densely packed in than they are, which means we did not plant enough. 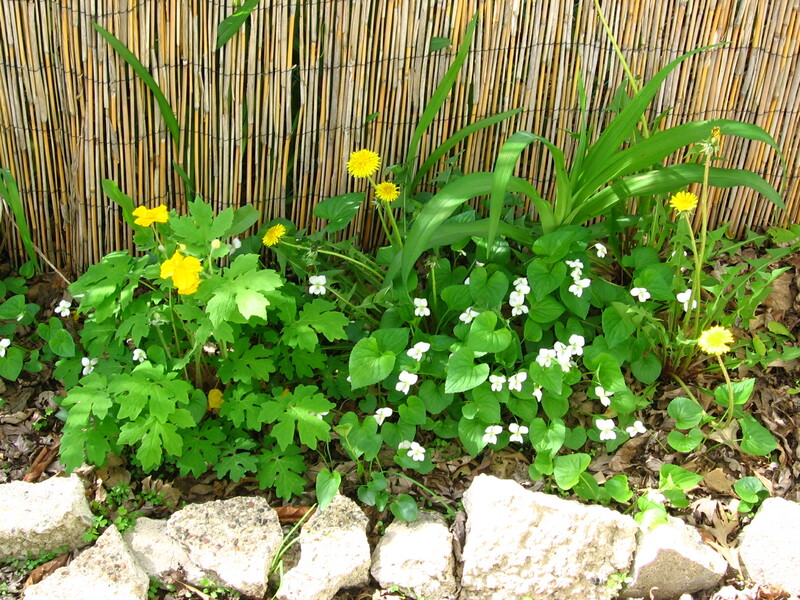 Also, there were lots of weeds growing in the bed, unexpected since the soil was from bags. So I weeded the bed and thinned a couple of radishes that were squeezed too closely together. What has come up, I am very happy with. Now the fabric is off the bed I hope rabbits don’t decide to come and enjoy the salad bar. the beans to climb, the beans feed the corn by fixing nitrogen in the soil, and the pumpkins with their big leaves shade the soil and provide a sort of living mulch. Pretty nifty, eh? was dead too, nope. It’s actually springing up in a number of places. I am relieved by that because peppermint is supposed to be indestructible and if I had managed to actually kill it, what a blow to my gardening ego! I had also resigned myself to the sunchoke not coming back and was trying to think of all sorts of excuses since that, too, is supposed to be a big spreader and easy to grow. I was pleased to discover some small leaves unfurling through the mulch this morning. All this makes me wonder if the alpine clematis we pulled out thinking it was dead maybe wasn’t dead after all, just later than usual in getting started. Too late to second guess that one though! Besides, its removal made room for one of the winterberries Bookman wanted so much. Dinner this evening is going to be a tasty salad. The lettuce in the garden isn’t big enough to pick yet so that came from the store, but we have picked French sorrel, dandelion greens and a few dandelion flowers to add flavor and color. If all goes well, in a week or two the salad will be coming from my garden, fresh picked. I can hardly wait! Congratulations on the creation of Amy Pond! Hopefully you attract a friendly toad or two — BUT, make sure it is not Toad from The Wind in the Willows, or next thing you know you’ll be dealing with insurance agents after he has stolen your keys and wrecked your car! Cipriano, thanks! Yes, we want a quiet unassuming toad, Mr. Toad, dapper fellow that he is, might find the accommodations a bit too rustic and the neighbors not so very obliging! CONGRATULATIONS ON FINISHING YOUR POND. WE HAVE BEEN ‘TRYING’ TO GET OUR POND TO PUMP WATER, OUT AND UP, TO SPILL OVER THE NATURAL ROCK FORMATION WHICH IS THERE, YET, WE ARE LOSING WATER IN THE RETURN TO THE POOL, AS THE WATER IS GOING UP UNDER THE ROCK INTO FRESH EARTH. TRYING TO FIX THE PROBLEM, WE HAVE PUT FOAM,WHICH HARDENS, INTO THE SPACES THE WATER IS GOING….BUT TO NO AVIAL. MY WIFE HAS BECOME EXASPERATED AND HAS SAID WE SHOULD JUST GIVE THE PUMPING EQUIPMENT TO MY SON. DOES ANYONE OUT THERE HAVE ANY IDEAS? waddlesbluhealer, thanks! Sounds like you have a leak somewhere, perhaps in the pond lining or in the pipe/tubing. Good luck getting it figured out! Water leaks are no fun because unless they are big an obvious they can be really hard to find. Finally…you got your pond!! Congratulations!! I must now really make some effort and try and create a pond in the balcony of our 8th floor apartment!!!! cirtnecce, thanks! It was so easy to do and really inexpensive. Good luck creating your own pond! Slow and steady as they say! Good for you … now let’s hope you keep those mosquitoes as bay. whisperinggums, it’s funny how we are so pleased over such a little thing. Fingers crossed the fish do their job! I’ll keep my antipodean fingers crossed for you too. Congratulations on Amy Pond. Well done Stefanie !!!!! Helen, thanks! It was so fun and easy! You guys are pretty amazing! And I love that you gave the pond a name! I love that you have a Doctor Who pond. I dug a large pond in my last garden, it took no time at all with the sandy soil but after several years we had to get rid of it as a nearby holly was getting enormous and we couldn’t reach over the pond to cut it back. I wanted frogs to eat the slugs and snails but I only got a huge toad, and he didn’t stay long. Our fish died fairly frequently and our wee boys buried them with lolly stick crosses, we had quite a graveyard! You could use some of your sand to make a small patch of it for the birds, a lot of them enjoy a dust bath in sand and it will stop them from churning up your soil and damaging seedlings. I enjoyed this post but I now feel the need of a pond too. pining, thanks! Just imagining the little fish graveyard made me smile 🙂 Thanks for the sand use suggestion! I got my little ceramic bird bath fountain going yesterday and used some of the sand around it. I’m sure your new garden would love a pond! Congrats on your pond. In case someone hasn’t already informed you, the biggest problem with all new pond owners: you soon find yourself wanting another — and bigger — pond! 🙂 I doubted this when I first heard it, just as we were completing our 12′ x 17′ pond, but, sadly, it was true. When I rebuilt it last year (10 years old), I briefly considered it, but I know how much work it was to dig the first time. Good thing I resisted it during those first few years. I’m feeling a bit negligent that I’ve never named my pond, although I have called it a few (unprintable) things over the years. As long as you have fish, you shouldn’t have a mosquito problem. Don’t feed your fish too often — let them eat the naturally growing algae — and get some sort of moving whirlygig garden ornament to place nearby. It will keep the birds who might be tempted to snack on your fish a safe distance away. THANKS ANNE, I WILL TRY THE WHIRLYGIG ORNAMENT, WE HAVE A BIRD POPULATION. I THINK I WILL CALL “HONEY DO” ABOUT THE WATER SEEPAGE PROBLEM. There are also little concrete alligators you can buy. You have to move them (just a little bit) regularly or the birds will not be frightened by them, but they do work with herons. Herons are my biggest problem. The hawk that lives on my property scares my fish, but he has never tried to eat them. I think he’s trying for the chipmunks, but he/we are losing that battle. Anne Camille, LOL, we already went bigger than the pond in the video and after only two days I am already wondering if we went big enough, or maybe a second pond…! 😀 Heh, perhaps you could choose a G-rated version of one of the R-rated things you’ve called your pond. Thanks for the advice about the fish and keeping hunting birds away! Nah! I think I’ll choose a much more pleasant name. It is really a pleasant spot, I’m very happy that 10 of my 11 fish made it through a nasty winter, and most of the mean things I called it were, as I discovered when rebuilding it last year, because of a gnawing gopher. So destructive! Chewed right through the liner below the waterline in multiple places. HANG IN THERE ANNE, MAYBE “MOTHER NATURE”, WON’T WIN OUT! I am allergic to mosquitoes too so I can understand Bookman’s concern. But that aside, that pond is awesome. You guys rocked the pond building! Nish, thanks! Of all the things I am allergic too mosquito bites aren’t one of them, which makes me a bit smug sometimes. Still, seeing how Bookman suffers I really feel for him, and you too! Hurrah! The pond is in! 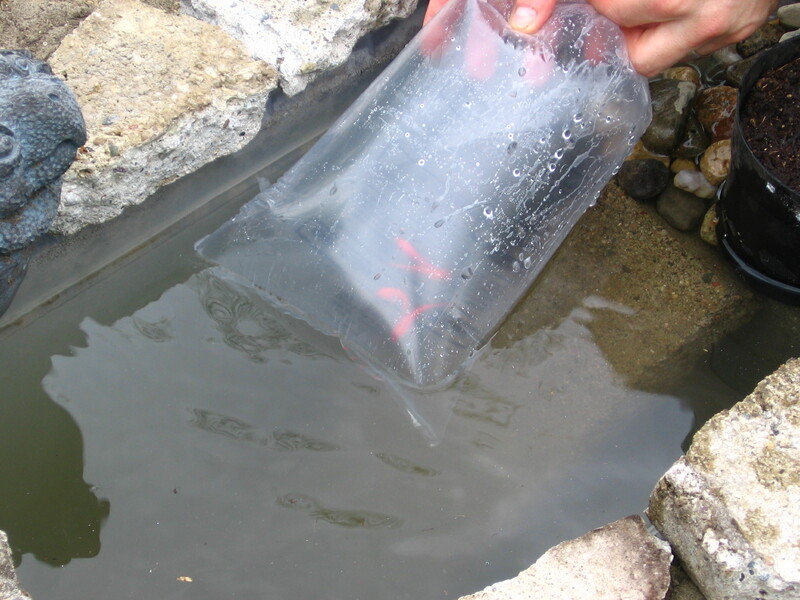 They make little discs of something or other that will kill the mosquito larvae but will not harm the fish. It’s supposed to be “natural” but I’m not sure what it is. I walked out the back door on Saturday and thought I caught sight of a hummingbird out of the corner of my eye. I wasn’t sure, though. And on Sunday morning, I looked up and at the feeder there he(or she was), having breakfast! I changed the nectar but am not sure how often I should do that. I also used organic sugar this time, but I’m not sure that’s okay. Do you know? Anyway, your garden looks wonderful. Grad, we are so excited over such a little thing. We keep going out to look at it and check on the fish. It’s like we are 8-year-olds! Yes, in my internet researches I did see those disc things but unfortunately they kill good bugs too so they would be a last resort. If the fish don’t do their job we have plans to get a solar powered aerator to move the water around. Hooray for your hummingbirds! I am sure organic sugar is just fine, probably even better. I loved the short video about pond building and you both did a very good job too. Cath, thanks! The video is fun, Archie is a cute little boy. 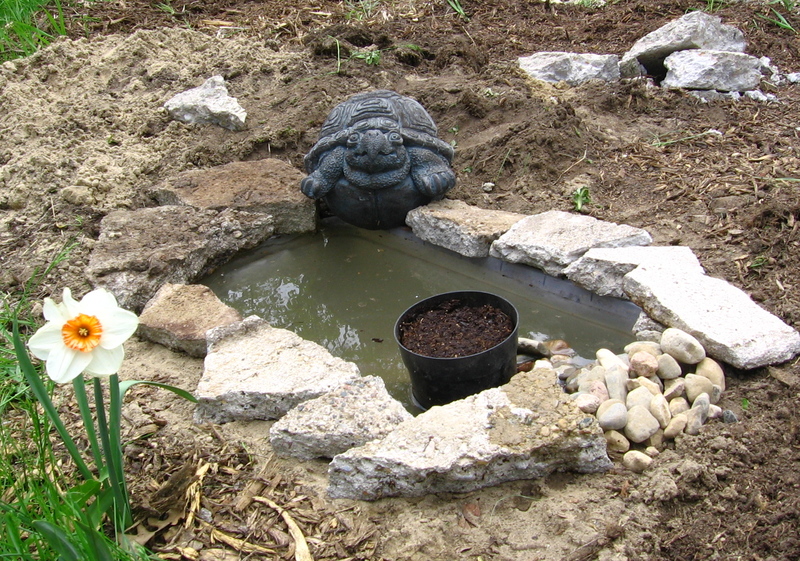 I love your pond and it is so cool that you made it yourself! Boarding, thanks! It was so easy. Danielle, our A/C came on yesterday afternoon. Ugh. We didn’t get much of a break between furnace and A/C! And yesterday it was humid here too and I was sweating withing five minutes of being in the garden. Ugh. But it was a good excuse to indulge in a thick, vegan milkshake 🙂 Perennial greens have been useable for about two weeks now. Another week or two the annual lettuces should let us start lightly picking leaves. They grow fast! Hurray! So is it just the fish who will keep the mosquitoes at bay? I must say, I would not wish to have walnut sized bites either. But it all looks very beautiful and cute and will doubtless look even better when your plants settle in. I really like your Amy pond and toad home! Very good work. I hope a toad spotting is in your not-too-distant future. Vanessa, thanks! I have high hopes for a toad. We came upon one in the garden many years ago when the Harry Potter movies were at the beginning of their run and called it Trevor. But we had nothing to entice Trevor to stay back then and he moved on. I hope this time we’ve made things more attractive! wherethereisjoy, you totally need a pond! And it is super easy. We have raccoons too. The bin is deepish and the fish can hide behind/under several rocks so hopefully that will be enough should a raccoon, cat, heron, or crane decide to go fishing.